Lisa who would ever have thought it? Always hated fitness and almost fell out with her partner Paul (Also December MOTM) as it was all he talked about. Finally Lisa got involved and is just as much of a CrossFit fanatic as Paul. She doesn’t quite have the “CrossFit Wanker” medal yet, but there is always next year hey? Lisa tries so hard and always pushed herself. Always wants to get better and has PT sessions alongside classes to help with her technique. She gets involved in classes she hates (like endurance) just so she can improve. and she has…..massively. So proud of how you have come on and this is very well deserved. M – Congratulations on being member of the month. As mentioned here are some questions so you can tell your story. So how long have you been doing CrossFit? 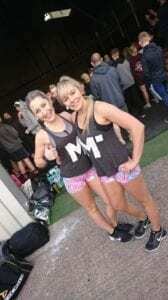 L – I started CrossFit and Msquared in April, so around 8 months now. Time flies!! L – I originally started as a 6 O’clocker but then changed my hours at work to accommodate some family commitments and I’m now part of the 5pm crew (usually around 5.04pm by the time I arrive if we’re being precise). I finish work at 4.30pm so can get there for 5 and still have time after class to do other things. Although it’s usually half 6 by the time I’ve recovered and feel able to drive I love the 5pm class. We usually have team Aggy Engines, finishing the WOD in record time without breaking a sweat to help spur us on! And Rick bringing the best banter, box jumps and heavy lifts! Oh, and I’m also a part time member (soon to be full time!) of Saturday’s endurance class! I have only attended a few of these classes so far (2 of which were test weeks – THAT BIKE!!) but they’re great for working on your engine and I will be attending a lot more regularly in the new year. L – So I have been trying to talk everyone I know into trying CrossFit! I honestly believe if I can do it then anyone can. 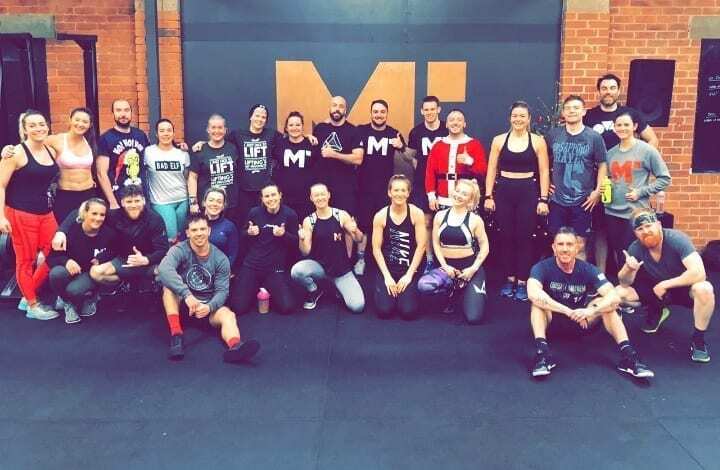 It’s so good for your confidence, fitness, mental health, physical health, strength, and the members and coaches at M Squared are amazing. I’ve made some great friends and it has become my second home and favourite place to be. Everyone is so supportive, welcoming and encouraging and they genuinely want to see you do well, it’s a special place. I really don’t think there are any negatives (except when Em programmes nine million wall balls every Thursday!) so if you are thinking of giving it a go, just do it, you won’t regret it. 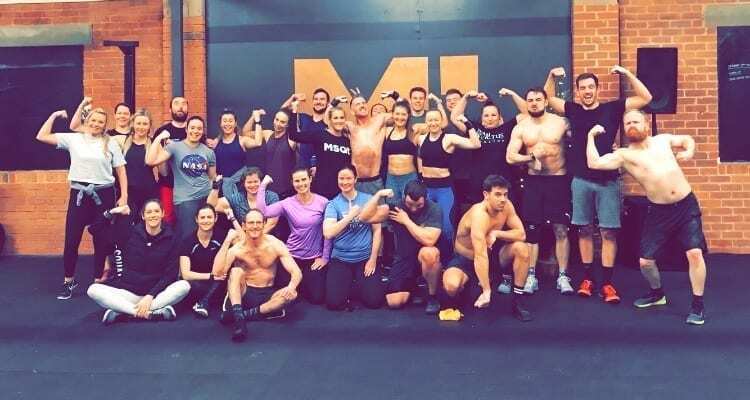 There’s no point in waiting until you feel fitter or stronger etc, because even the fittest in the gym all feel wiped out (except Oz) after a workout, it’s what it is all about. L –THIS!! Ha ha I am still shocked! 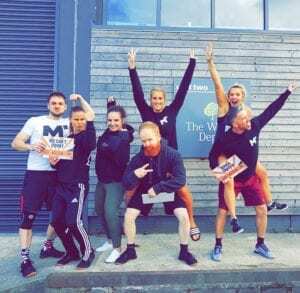 There are loads of things I feel I have achieved over the last few months but the biggest would probably have to be my 5k park run that I did with the endurance class. I have always hated running and when I joined I couldn’t even run 400m in a WOD without having to break at least once. So to go and run 5k without stopping was a big deal for me. I also feel like my confidence has grown massively since I first joined M Squared. There were things I didn’t feel I would ever be able to do, and things I wouldn’t even attempt, but with the support and encouragement from the coaches and members my attitude changed and I now have the confidence to at least try. (And to enter a competition every month after vowing to never do a single one ha ha ha). M – Thanks so much Lisa. Cant wait to see you smashing these goals….and every singe competition going!